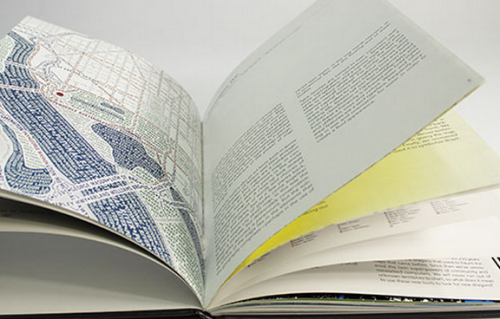 The call for map submissions has just been announced for the second volume of the Atlas of Design. An initiative by the North American Cartographic Information Society (NACIS), the atlas acts as a showcase of beautifully designed maps alongside commentaries that explain a little of why the map is as it is and how and why it works so well both graphically and as an information product. In many ways the atlas was an inspiration for our picto-bite approach MapCarte series but crucially both are curated by cartographic experts. This provides a look into the world of mapping from authoritative sources. We need more of this! Edited by Tim Wallace and Daniel Huffman, the first volume (published in 2012) presented 27 beautiful maps and even though beauty is so often in the eye of the beholder there can be no argument that the selection represents some of the finest contemporary mapping of the last few years. The 2014 volume looks set to improve on the first (no pressure there!) but this is a community effort so we’d encourage those of you who produce stunning maps to consider contributing. In a world where quantity is currently out-pacing quality, the Atlas of Design is a much-needed antidote to much of what we see. It acts to inspire people towards a greater appreciation of well-crafted maps and how they can be far more powerful when properly thought-through, designed and produced. This is more than just ‘pretty maps’ and a gallery of aesthetically pleasing maps; this is about showing the value of the art and science of cartography; the expertise that a cartographer can bring to bear; and a return to high quality over mass production. Submit your maps here. Go on…you know you want to! This entry was posted in General and tagged atlas of design by @kennethfield. Bookmark the permalink.